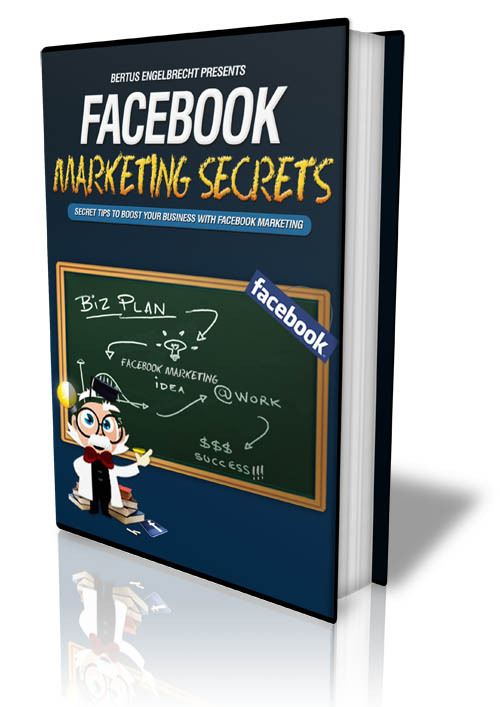 My NEW Special Course "Facebook Marketing Secrets" Will Open Your Eyes to secret Facebook Marketing techniques and how to harness Facebook for massive traffic and bigger profits. If you don’t agree it’s exactly what you needed, full of handy information that can help you to generate more traffic and make more money using Facebook, you can take advantage of my 30-day unconditional Guarantee – and simply contact me for a refund! 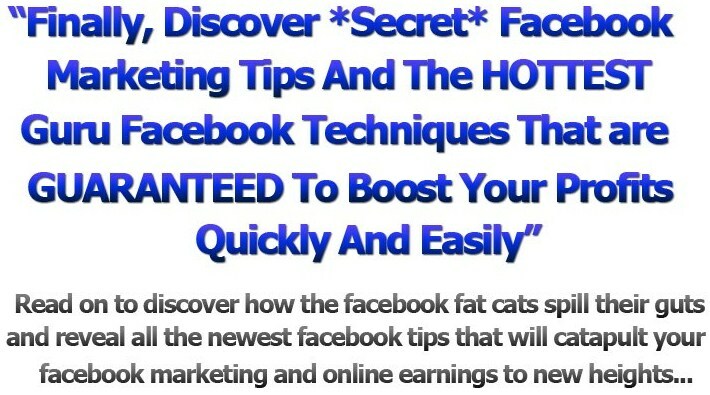 Have you been struggling to market your websites on Facebook, but haven't seen the results you crave? Are you tired of researching and trying all the different facebook marketing techniques like facebook groups, fan pages and facebook advertising without getting more traffic or making more money? The problem that you have is that you may know how to market with facebook, but you don't know all the secret tips that the facebook gurus use every day to accelerate their facebook marketing. Why should other people be making HUGE profits marketing their websites or affiliate offers on Facebook and not YOU? There is no reason in the world, why you shouldn't ALSO make a lot of money with facebook. I have compiled a MASSIVE list of 52 TOP Facebook tips and Secret techniques, coming from very successful Facebook marketers, that will help give you the EDGE in Facebook Marketing. Now, you can also get your hands on these tips and use them to become a Facebook Marketing guru in your own right. YES! Now YOU will have the power to harness the great power of Facebook and it's 500 Million users to generate more traffic to your websites and make MORE money easier than ever before. This complete eCourse will reveal 52 HOT Facebook Marketing Tips that will help you to BOOST your facebook efforts to drive more traffic to your sites and generate bigger online profits. Maximize your effectiveness of Facebook Marketing. How to reach out to the target group optimum results. How to find loads of fans for your fan page. Establishing your presence and your brand for maximum profits. How to make a donation drive for easy cash. Getting more fans and bigger profits by creating facebook contests. SEO for your facebook fan page for HUGE traffic. How to become wealthy by setting up all the stages of a facebook sales funnel. Top insights for facebook advertising. Effective copywriting for facebook ads that will force people to buy. Common ad mistakes that you DON'T want to make. How to split test your results and skyrocket your earnings. Creating a killer landing page that grabs people's attention and keep it. How to combine the Marketplace and networks and make a KILLING. Using Facebook surveys to put your marketing efforts into overdrive. 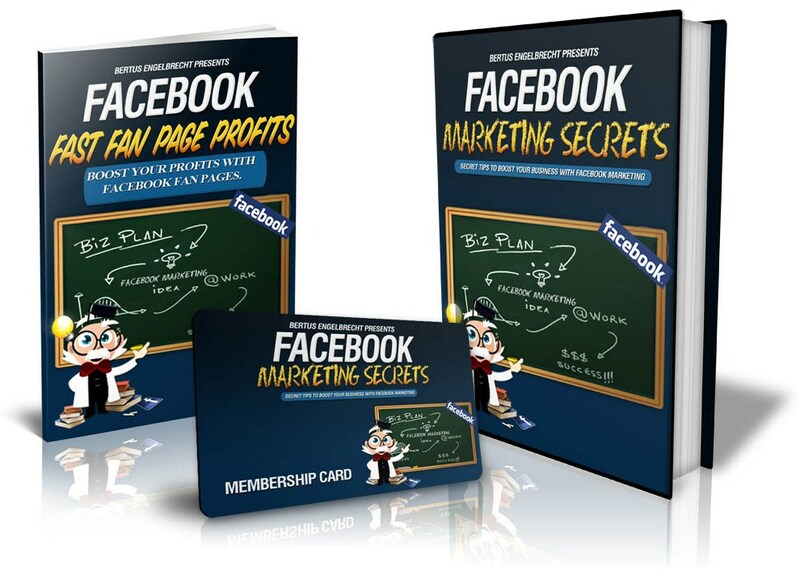 Discover how you can easily create your own Facebook Fan Page from scratch and monetize it for HUGE profits. You will learn how to build a huge viral fan base and how to drive traffic to it and from it. 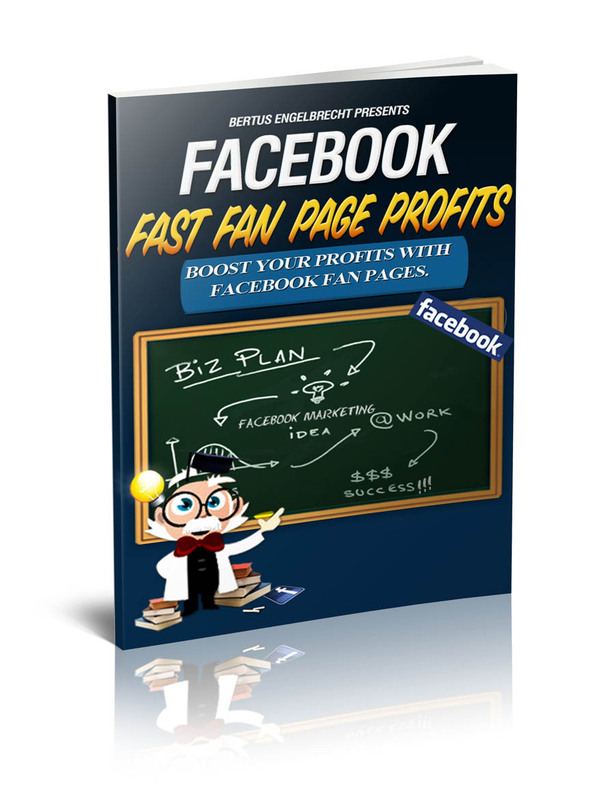 Market your business with facebook fan pages and earn easy money. What social media marketing is and how to benefit from it. Why you should market with Facebook? Should you use groups or fan pages? What exactly are Fan Pages and how can you market with them. How to do SEO for your fan page for maximum traffic. How to build a good relationship with your fans for long term profits. Step-by-step blueprint for creating your own money making fan page. Tips and secrets on how to monetize your fan page. Driving traffic to your fan page and from it. As you can see, this product is all you need to give you the edge to beat your competition. You will be able to call yourself a Facebook Marketing Guru in no time at all and boost your income ten fold easily. Spread the word about it and earn 80.00% of the purchase price on sales you refer.